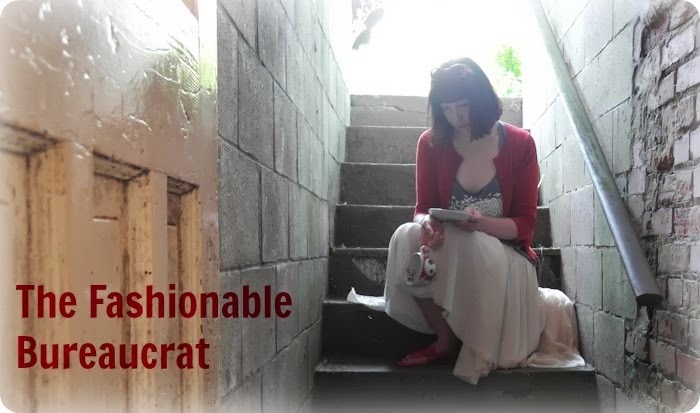 The Fashionable Bureaucrat: Catching up. I bought these boots on a bit of a whim. They were on sale and in my size. I'm not sure about the "furry" uppers and I'm not going to be able to wear them again until fall. I do love the metal heel though. You will see these shoes a lot this week. My feet were a mess from all the walking in bad footwear so I just stuck with these shoes which are very comfortable. Maybe not the best walking shoes but certainly better than what I had been wearing. 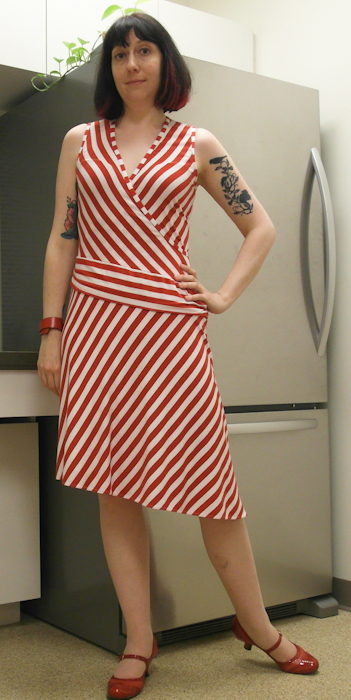 I like this dress but I think I'll be putting it aside for a while. I wore it a lot during the month I was in TO with only a few things. Plus I'm not as comfortable wearing it without tights and it's definitely too warm right now for anything other than bare legs. 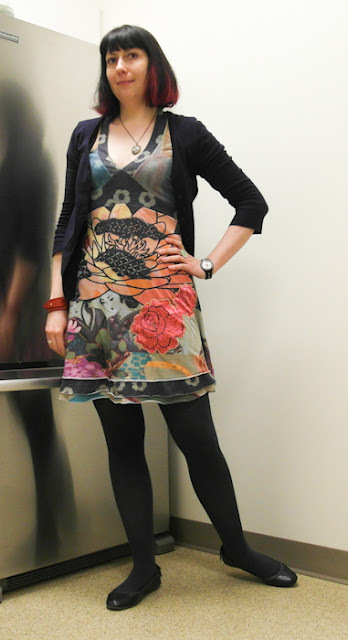 This outfit was appreciated by my work mates. I'm not sure if everyone realized they were giant ants but no one said "yuck". I need to replace this cardigan soon. It has served me well but it's starting to pill and lose its shape. I was glad to be reunited with these striped shoes! I have decided. I hate this belt. I hate the zipper, I hate that it's mostly elastic, I hate how it fits. So I'm going to purge it. Out out damned belt! 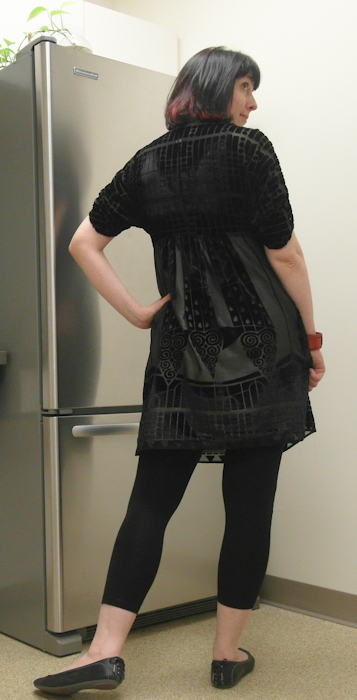 I took a back photo but it just showed how wrinkly this skirt gets after a day of sitting. DELETE! 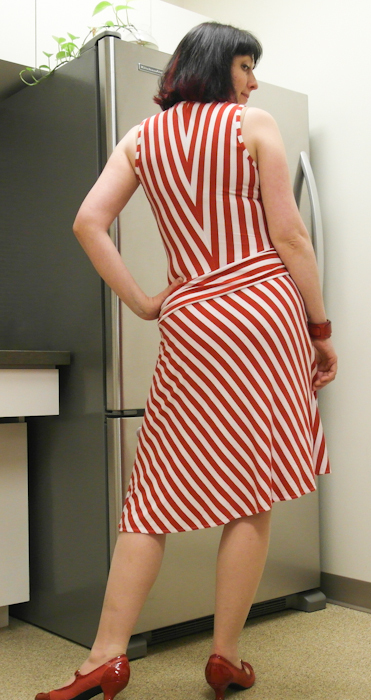 Here's my "Canada Day" dress. It was starting to get HOT. Stripes are big right now. As are asymmetrical hems so even though this is an older dress that I found in a consignment store in Halifax, it feels pretty "current". True confession time (and a PRO TIP). I had to hold the front closed with a big paperclip. Quite a fantastic improvisation if I do say so myself. And I quite like the back of this. Whoever designed it was thinking when they matched up those stripes into "consummate Vees". This is a long post. I'm running out of stream. I like how the back drapes down. 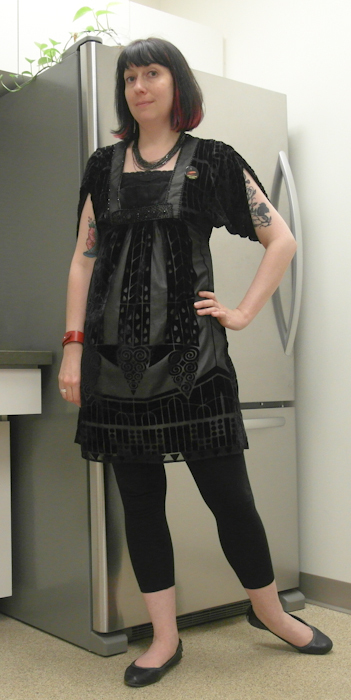 Ok, this is the last outfit since I forgot to bring my camera on Friday. Black two days in a row. Must be feeling dark. I was wearing my "I believe you have my stapler" Office Space pin. Only 1 person in the office got it. Ok, my next post with be later today with today's outfit and the opening of the new Fluevog Store! I apologize for how this post formatted. I messed around with it trying to fix it but I mostly failed. Missed you! So glad you kept taking pictures along the way. Your style brings a smile to my face each day! And love the hand knit cardigan. Cardigans are one of favorite sweaters because it's hip and fashionable. Also, it keeps me warm from cold weather. I love those beautiful pictures. So glad you have all your clothes and shoes back again. I really like the ant dress, but it reminds me that I have been battling a serious ant infestation in my kitchen for the past week! I've been gradually packing away the cold weather clothes, Yay! You must have been very excited to see your entire wardrobe again. I always find when I'm travelling that I get so sick of picking just from what's in my suitcase. 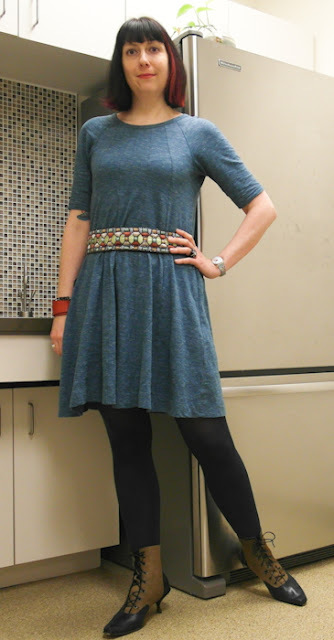 Also, I wore two skirts last week that I realized can only be worn with tights. Those definitely got pushed to the side of the closet. Oooh I do love the new Cydwoqs. I still haven't tried a pair of their stiletto heel, the wooden ones are just as comfy as their flats though. Very glad to have you back in the blogging world, Megan! And in such an array of dresses and shoes. 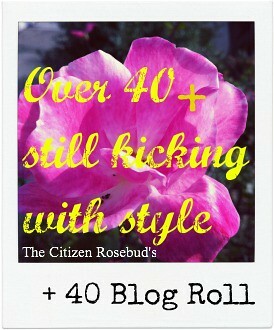 I've been reading without commenting for a while, but I felt it was finally time to say I love your blog! I always feel happy and creative after reading it and seeing the cute ways in which you style your clothes. 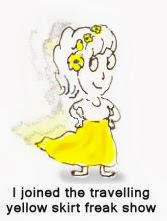 Hurray, you are connected up and back in blogging action, Megan! And a feast of lovely outfits - the ant dress and the red/white striped dress are favourites, I am rather taken with the furry boots, and you are allowed to wear black 2 days in a row if you do it with fishnets! That ant dress is wonderful. Getting your clothes back must have been like Christmas. Oh, well done - massive posts are exhausting to write, much less format. I love all your new outfits! The ant dress really stands out. I had a back-and-forth with a coworker quoting "Office Space" (we actually have a TPS project at work, which gets a lot of jokes about it), but so many people NEED to see that movie. Fantastic to see you back in action, Megan! I love the furry Cydwoqs and all of the stripey goodness, congrats on being reunited with your stuff. At my previous workplace, I gave the most coveted Kris Kringle gift, which was a package of pens, and had to wait til the receptionist retired to get a stapler of my own (snagged it off her desk). Office Space FTW. Welcome back to the interwebs. How have I just now noticed your formidable collection of great cult-y shoes? so glad to see you rocking fabulous outfits!, so many pretty shoes and amazing prints, love that ants dress!